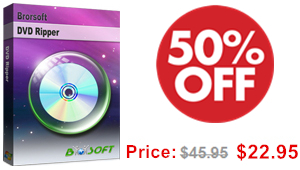 Brorsoft Studio offers Blu-ray Ripping tool, DVD Ripping Tool, Video Converter Ultimat big discout for September and October till 3rd Sunday, October23, and receive up to a 50% discount. Just turn to Autumn Promotion offer. Summer is over. The weather is getting colder. The leaves are quickly changing. The days grow shorter. What does this mean for you and your family? Why not watching an DVD and Blu-ray movies with your kids or your family in the living room after dinner, or shot the family time with the autumn landscapes and wet yards and lanes. Brorsoft Studio offer extra special autumn offer in which to enjoy the family time. Rip/Transfer Blu-ray to iPad Pro, iPad Mini 4/iPad Mini 3, Playback with PS4/PS3. Act as all-in-one video converter, DVD ripper, Blu-ray Ripper, DVD/Blu-ray copy software and video editor. – AVI, WMV, MP4, MOV, M4V, MTS/M2TS, AVCHD, DVD, VOB, MKV, MOD, TOD etc. – Much faster than other converters and with Lossless Quality Conversion. – Rip/Copy almost any Blu-ray and DVD for persional use such as play on your tablet, smartphone, TV. – Trim, adjust, merge, crop, rotate, watermark, subtitle etc. Hope you enjoy the Brorsoft big AUTUMN PROMOTION, if you like it please share it to your circle with your friends.